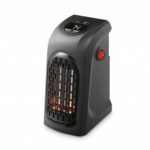 The Desktop Electric Heater provides quick, quiet and efficient heating with 2 modes. 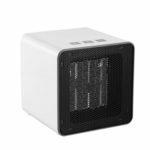 It features tip-over and overheat protection to ensure safe use. The slim design makes it fit in almost any room or design. It will no doubt make a room more comfortable. Perfect for bedroom, nursing room, reading room, office, and more. 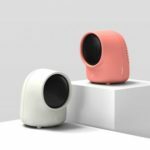 The personal space heater can heat-up effectively and fast within 2 seconds when turned on, so you can quickly feel the strong warmth in cold winter. There are two temperature modes: heat and cool, you can choose the model according to your needs by the button on the top. 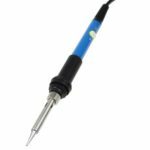 Made of flame resistant material and with thermostat control function, so it can be safe and durable for years. Backed by multiple protections: overheat protection and tip-over protection, it will auto shut off when lifted up or tipped over. 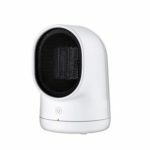 The space heater can auto oscillate for 45 degrees when you touch the control button on the top, then you can enjoy the warmth or cool from wide angle. There is a white salient point on the base bottom to avoid falling by accidental touch. Low noise design, will not disturb your sleeping, reading, working and so on. Dim light cares your eyes while provides you lighting in need. 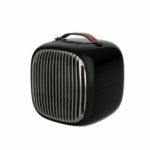 The desktop space heater comes in a portable size and can be carried by the groove on the back. It is portable and easy to use in different places, such as home (living room, bedroom, bathroom, etc), office or anywhere with a compatible socket.